Manufacturer of a wide range of products which include cut to length machine. Leveraging by the vast experience of this domain, we present clients with the premium quality of Cut to Length Machine. 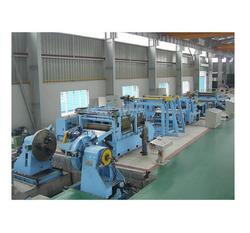 Appreciated for its consistent performance, excellent cutting efficiency, low power consumption and enhanced functional life, the cut to length machine is fabricated by using the latest technology. In accordance with the specifications provided by the clients, the cut to length machines can be customized at our end. Looking for Cut To Length Machine ?